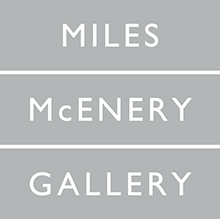 The New York based gallery Ameringer | McEnery | Yohe has announced a forthcoming solo exhibition by the Brooklyn based artist Brian Alfred which will present recent works under the title It Takes A Million Years To Become Diamonds So Let’s All Just Burn Like Coal Until The Sky Is Black. The solo exhibition will feature new images by Brian Alfred based around the exploration of automobile racing, his cropped abstract works capturing everything from the excitement of the cars and racing through to the global investment elements of companies that contribute the money to the races by including representations of oil slogans in his images. 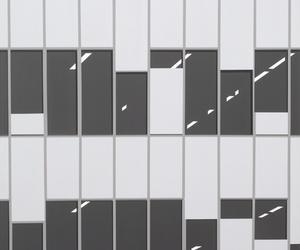 The exhibition at Ameringer | McEnery | Yohe, who last year presented a show of work by Wolf Kahn (see more in this video), sees Brian Alfred capturing small slices of time that aim to capture the emotions of watching the races. In the It Takes A Million Years To Become Diamonds So Let’s All Just Burn Like Coal Until The Sky Is Black solo exhibition at Ameringer | McEnery | Yohe, Brian Alfred is trying to depict more than just a visual representation of racing cars. The sometimes simple but dynamic images the artist creates aim to portray all the feelings one may get from watching the racing, from the confetti floating in the air to celebrate a win to images of fire and shrapnel that go with the danger of crashing at high speed. Beyond the immediate sensations of physically watching the races and the excitement that flows through the spectator at such times, Brian Alfred has also chosen to explore the global properties of racing in his recent body of work, so we get the simplified slogans of oil companies associated with the sport and abstract patterns that are based on the patterns of race tracks found around the world to give a global overview of the sport and all it entails that includes speed, wealth, oil, beauty, danger, disaster, excess, calamity and the thin line between the joy of victory and the possibility of dying on the track. (If you have a thing for fast cars take a look at the All BMW Art Cars article and also the work of Gregory Johnston in Chromatic Interactions for another artist inspired by motor sports). Brian Alfred, born 1974 in Pittsburgh, Pennsylvania, is an artist that has become known for his works that consist of collages, paintings and digital animations. His works, including the new pieces in It Takes a Million Years To Become Diamonds So Let’s All Just Burn Like Coal Until The Sky Is Black solo exhibition, are often inspired by technology, how it alters our perceptions of the world and how we process information. His works of art are often created from photographs that are reduced to their basic forms using a computer that results in images that incorporate flattened bold colour fields. His images rarely include figures, although he did produce a series of portraits in 2009 of cultural figures that have influenced his work, titled Millions Now Living Will Never Die, it included images of Andy Warhol and James Rosenquist. Brian Alfred is also very active in the music scene, both in making music and collaborating with musicians who create images for his animations and in response to his creations. You may like to check out the work of Jonas Wood (Wood and Kusaka at Gagosian Hong Kong) and David Hockney who have a similar approach in their style of painting. It Takes a Million Years To Become Diamonds So Let’s All Just Burn Like Coal Until The Sky Is Black by Brian Alfred opens at Ameringer | McEnery | Yohe in New York on 5th February 2015 and runs through until 14th March 2015. An opening reception will be held on 5th February 2015, 6:00pm – 9.00pm with live music from Ian Williams (Battles).